#1 Wealth coach and best-selling author William R. Patterson appears on 1580 AM to discuss the best wealth-building strategies in the midst of of global conflict and struggling world economies. #1 Wealth coach and best-selling author William R. Patterson appears on 1580 AM to discuss the best wealth-building strategies in the midst of bank failures, historic housing troubles, and bear financial markets. William provides a fresh, highly-effective road map to financial and entrepreneurial success. Learn how to build your million-dollar business. Is IndyMac, the third-largest banking failure in U.S. history, a sign of more failures to come? #1 Wealth coach and best-selling author William R. Patterson appears on 1580 AM to discuss the best wealth-building strategies as the U.S. economy continues to struggle and its financial markets inch closer to bear territory. With the falling dollar, rising U.S. inflation, and increasing opportunities overseas, is it better to invest in the U.S. or abroad? #1 Wealth coach and best-selling author William R. Patterson appears on 1580 AM to discuss the best wealth-building strategies for emerging markets in the midst of a historic U.S. financial crisis. #1 Wealth coach and best-selling author William R. Patterson appears on 1580 AM to discuss smart wealth-building strategies in a recession. #1 Wealth coach and best-selling author William R. Patterson appears on WARL AM 1320 with Raven Blair Davis to discuss small business ideas and home based business opportunities that you can take advantage of immediately. #1 Wealth coach and best-selling author William R. Patterson appears on PowerPOD with Jim Bouchard to discuss what you should be doing now as a business owner and investor to profit in a recession. William provides a fresh, highly-effective road map to financial and entrepreneurial success. If you are struggling to find a unique business idea, don't try to reinvent the wheel. Use BARON Business Coaching and these twenty-eight top-selling business startup guides to help you get started immediately. 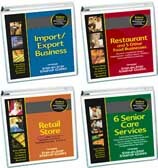 These powerful resources will provide you with everything you need to begin building your million-dollar business. Leverage the breakthrough BARON model in order to generate highly effective, low-cost media exposure for your business, help successfully brand and launch new products and services, head off competition, improve operating cash flow, automate processes, grow profits, and create an exit strategy for your business. William provides a fresh, highly-effective road map to financial and entrepreneurial success. Learn ways to save thousands of dollars with free BARON wealth-building resources. Wealth coach and best-selling author William R. Patterson appears on 1580 AM to share ways to protect yourself and find new sources of income in a recession. Former Federal Reserve Chairman Paul Volcker and many others have said we are facing the "mother of all crises." Barons know with every historic crisis, there is also historic opportunity. What are you doing now to prepare yourself? Will you be a victim or victor in this environment? Last month alone, over 80,000 people lost their jobs. It is now more important than ever to develop multiple streams of income. For most people, a job is a $50,000 solution to a million-dollar problem. And if you have a million-dollar problem, you of course have to use a million-dollar solution. To leverage your time and build significant wealth, you must start a business. Despite what many people think, you are never too broke, your credit is never too poor, and it is never too late to start a business. Any situation of lack can be solved through a partnership. You just need the right business model and coaching. Take a moment to think about your passion and how you can start building wealth through your own business. If you are struggling to find a unique idea, don't try to reinvent the wheel. Find a concept that is working well in another market and bring it to yours or vice versa. Think nationally or internationally and create local partnerships. Once your company is established, use strong branding, increased integration, and top-tier strategic partnerships to fend off competition. To further assist you, here are twenty-five low cost and home based businesses that you can start today. Discover your great idea and learn how to use THE BARON SOLUTION™ to finance and profitably grow your company. Wealth Coach William R. Patterson appears on 1580 AM to discuss ways to profit and protect yourself in a recession. William provides a fresh, innovative road map to financial empowerment and debt-free living. Learn ways to save thousands of dollars with free BARON wealth-building resources. Former U.S. Federal Reserve Chairman Alan Greenspan warns the current financial crisis is likely to be the worst since World War II. You can no longer afford to stick your head in the sand and hope things will be OK; nor can you rely on others to make your business and investment decisions for you. You have to increase your financial intelligence. As reported in Business Week, finance companies had a record year for layoffs in 2007 with over 130,000 job cuts announced. Since July 2007, major Wall Street firms alone have announced more than 34,000 layoffs. This number is close to the 39,800 jobs Wall Street firms slashed in the comparable nine-month period after the Internet bubble burst in 2001. Bloomberg says, "The comparison suggests things could get much worse: Two years after the Internet implosion, the number of lost jobs on Wall Street eventually reached 90,000." Today's financial, business and real estate markets present converging risks that many business owners and investors have never seen. Greenspan's comments and the recent collapse of Bear Stearns should be a wakeup call to diversify your portfolio, build up your cash reserve, and increase your financial knowledge so that you can take advantage of today's historic opportunities. Bear Stearns investors saw their stock drop from over $150 to less than $5. Could that happen to one of your stocks, your 401(k), or the company you work for? Ask investors and employees of WorldCom and Enron. Whether it is inept or ethical decision making by your company's management or an investment advisor telling you to stay invested in a company that is losing money, without the right coaching, it can mean absolute devastation for you as an investor. Realize, while many Wall Street firms are losing billions of dollars and downsizing tens-of-thousands of employees, there are huge opportunities for those with the right knowledge and proper training. You need an expert guide to assist you. 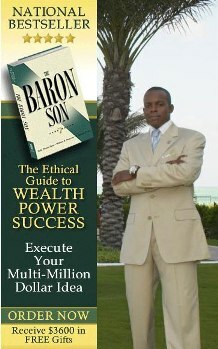 Leverage BARON Wealth Coaching to help protect yourself and profit in this volatile environment. your cash flow and begin building wealth. By starting a small or home based business, you are likely to increase your tax deductions, so you can work with your accountant and adjust your withholdings to free up more cash flow throughout the year to invest or operate your business. This is preferable to letting the government hold your money all year without paying you a dime in interest. The government encourages business ownership and rewards entrepreneurs with increased tax credits, deductions, and shelters. And not only do you have these lucrative tax benefits through your business, you also have the opportunity to stash away more money for retirement by setting up a SEP IRA, Keogh plan, or 401(k) for your company. When it comes to financing your business, there are quite a few options available. For smaller companies, you can partner with others, pull in sponsors, and develop trade lines of credit, which are surprisingly easy to get for those with right knowledge and properly structured businesses. It only takes a little bit of intelligent thought and action to make a big difference in your bottom line. Many people including high-wage earners are struggling financially and living paycheck-to-paycheck. Here are five simple BARON strategies that will help you increase your income and savings. Find a coach or mentor and expand your network. One of the quickest ways to increase your income is to change the people with whom you spend the majority of your time. It is often said that if you take the median income of the people with whom you spend the majority of your time, that number will serve as an accurate predictor of your income. Forming mentoring relationships and networking with individuals who have achieved a higher level of financial success will expand your knowledge and expose you to new investment ideas and unprecedented opportunities to build wealth. Get paid what you are worth. If you are an employee that means going after higher paying jobs in your industry. If you are business owner, that means going after larger clients and deals. It is important to make sure your time is directly aligned to where the lionâ€™s share of your income either is or is going to be, and to make sure that you are doing the most important activities every day that will change the condition of your life or business financially. Reduce your Expenses. Cutting your expenses is an easy but significant way to boost your net income. You can increase your income by thousands of dollars by consolidating your long-term debt and reducing your interest rates; doing comparison shopping and buying products in bulk; purchasing consolidated services; and doing a better job of budgeting and planning to reduce late fees, bounced check fees, and penalty fees. 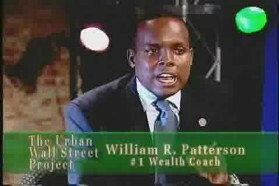 National best-selling author and wealth coach William R. Patterson provides insights on the seven major reasons that people struggle financially, all of which have nothing to do with money, in part six of an in-depth interview for The Urban Wall Street Project with Earl Christian III. Financial independence is not a rational decision. If it were a rational decision, more people would take decisive action to do the things that would make them financially free. Financial freedom is about overcoming your emotions â€” especially fear. Most people do not truly believe they have the power to change the condition of their lives starting from where they are. Despite what one may think, you are never too broke, your credit is never too poor, and it is never too late to begin improving your finances or to build a million-dollar business.A coach can help you think bigger and change your beliefs about what is possible by teaching you the things you don't know that you don't know. Those with limited networks are always the last know and the last to be helped. At least 80% of your success will be the result of soft skillsâ€”your ability to network, form mentoring relationships, strategic partnerships, and political alliances. Without question, your network is a direct reflection of your net worth; build one and the other will grow. Remember, any situation of lack can be solved through a partnership. Most people struggle financially because they attempt to build wealth with a linear approachâ€”using one investment strategy, one portfolio, and one stream of income (a job). And for most people, a job is a $50,000 solution to a million-dollar problem. If you have a million-dollar problem, you of course have to use a million-dollar solution. To build significant wealth in a way that brings you greater freedom with each dollar made, you have to learn to manage multiple investment strategies, multiples portfolios, and multiple streams of income. You also have to leverage the three major wealth building vehicles, the stock market, real estate, and entrepreneurship. Watch Video and Read Entire Article Now! There are some common traits that allow industry and financial Barons to profit in volatile markets. Using their networks and specialized tools to gauge market sentiment before making buy or sell decisions. Not rushing into investments with a scarcity or â€œneed to do a deal or need make a tradeâ€� type of mentality. Barons are patient; they know market corrections are inevitable and time and the overzealous nature of unskilled business owners and investors will present them with the buying opportunity of a lifetime. Doing proper valuations of the market and their holdings to know when each is overvalued and poised for a correction. Using multiple strategies and market instruments to hedge and profit from downward moves in the market. Maintaining large cash reserves to handle emergencies and to take advantage of investment opportunities and/or partnering with others who have such reserves. Down markets present opportunities to make money like no other. Master this skill set and you will build your fortune in a third of the time.